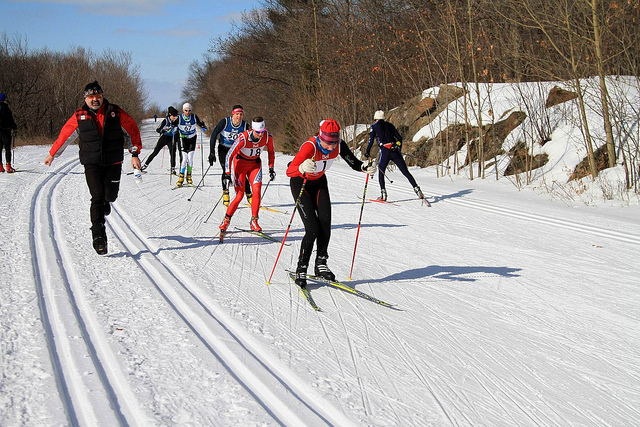 Gatineau Loppet Archive :: Skiing in Ottawa and Gatineau Park :. Gatineau Loppet Archive . . . 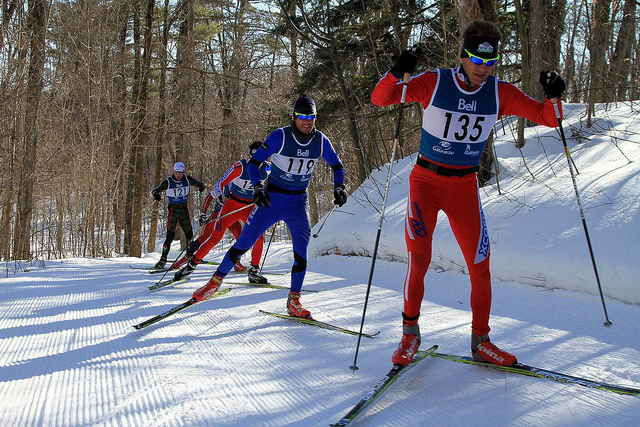 The Gatineau Loppet, formerly the Keskinada or just "Keski" has long been Canada's largest cross-country ski event attracting close to 3000 participants over the weekend. It's often the only race on many skiers' schedules. Given the importance of this race for many, we've dug through our archives for some helpful race strategies, nutrition tips, and training advice. We've also included a retrospective of race previews, and results from earlier years. We're hoping to update this with more information, and would like to expand on this archive of Keski culture by inviting race reports from our readers. Don't be shy! Lee's Workout of the Week - Keski Ready! 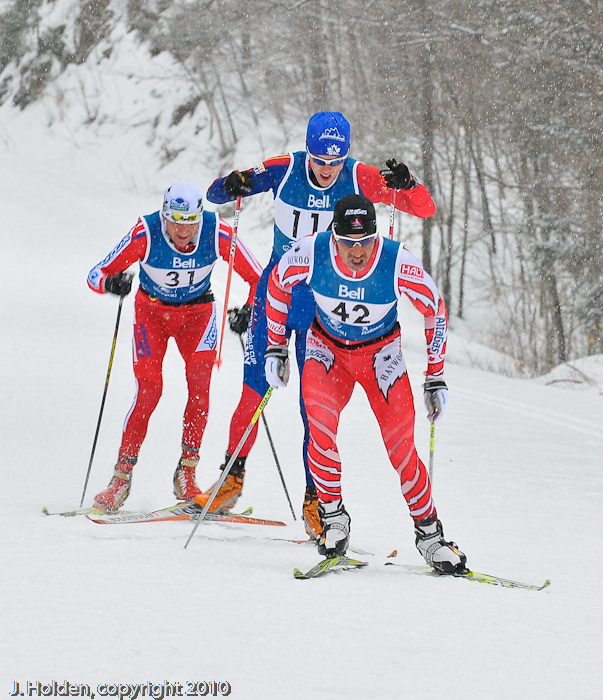 Ski your first Keskinada Loppet: Some tips to get you started by Claude Laramee. Don't underestimate the importance for nutrition and hydration in long athletic events! Here is some good advice to optimize your race performance, and some entertaining reading from athletes who neglected their nutrition during the Keski. Beating the Bonk : A cross-country skier's dynamic glide turns into a sorry shuffle, and fast snow now feels like molasses; a runner's stride becomes a walk; and any blip of a hill looks like Mount Everest. What exactly is going on when your muscles and brain scream "no more"? Is this a situation you can avoid? Yes! if you follow the recommendations in the article. The race was conceived in 1978 in the Lachute region, over 100km northeast of its current location. At that time the race was named "Riviere Rouge" for the Red River of the same region. Over time the race grew in popularity until the point where the venue was no longer sufficient for the number of participants. For that reason in 1982 the course was relocated to the Gatineau park. It was renamed the "Gatineau 55" for the park that it was held within and the 55km distance that it covered. In 1996 the race was once again renamed in order to better reflect the multiple distances and techniques of the various events held on the race weekend. In the fall of 2007 it was once again renamed, this time to the Gatineau Loppet to reflect the city and park in which it is held. In the fall of 2004 the Keskinada organizers revived their off-season event the popular "Keski Climb". 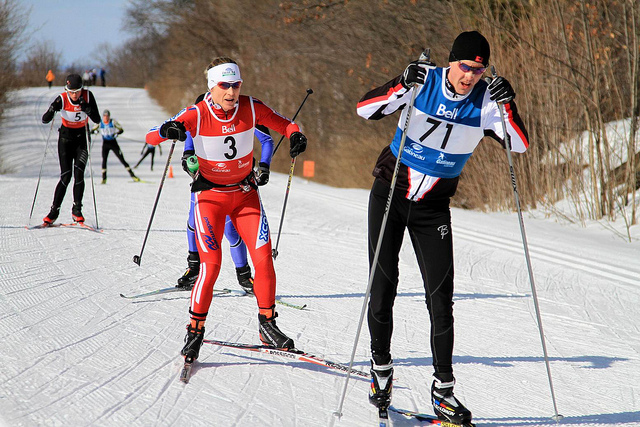 It takes place in Gatineau Park and offers several different types of races; such as roller skiing, cycling, in-line skating and running. In 2006 it had over 150 participants challenge the course as it slowly builds back to it's former glory which saw >500 participants complete the climb to Champlain Lookout. Unfortunately the event has once again been dissolved. Below are a collection of articles, photos and press clipping from as far back as possible. If you have anything to contribute, please pass it along! Got a Gatineau Loppet story to share? Send us an email - info@xcottawa.ca! Gatineau Loppet: The best edition we’ve had in the last five years! Gatineau Loppet: A brilliant day! Ottawa Citizen: Leaving it all on the course. Take a virtual tour of the 2011 Gatineau Loppet course.. Slipping and Sliding 50km to the finish. Loppet Litter - Remember to pack out your gels, bottles and garbage! XC Ottawa: Gatineau Loppet Everything you need to know! More than 20 countries were represented at this year's Gatineau Loppet. The course was modified again to accommodate a low snow year. The 49 km men's podium was close - with Alberta's Robin McKeever taking the win, just ahead of Alberta's Chris Butler in 2nd, and XC Ottawa's Karl Saidla in 3rd. On the women's side, XC Ottawa's Megan Mctavish had a specatular race, winning the event by over 10 minutes. XC Ottawa's Sheila Kealey put on a race bib for the 2nd day in a row, and won the 27km skate race, ahead of Louise Martineau in 2nd, and Colleen Mortimer in 3rd. Robin McKeever, Chris Butler, and Karl Saidla lead the 49km skate race. 2009 was a great weekend for racing! The tracks were fast, the Sun was shining and weather for a change was temperate. 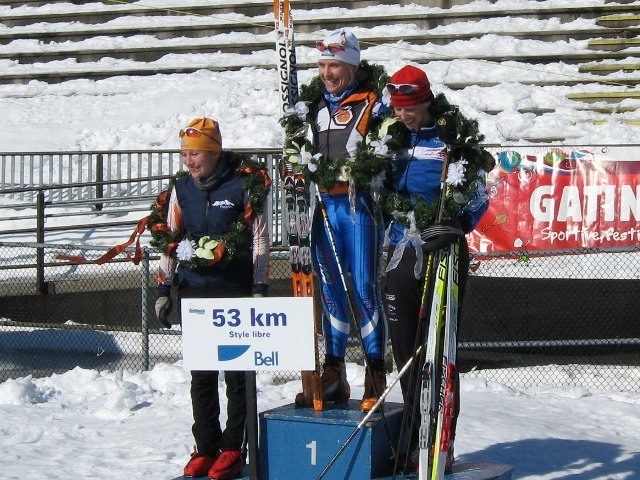 XC Ottawa skiers took full advantage of this to capture 4 podium spots in the weekend's premiere event the 53km Skate. On the women's side XC Ottawa swept the podium - Sheila Kealey 1st, Megan McTavish 2nd and Eva Szabo 3rd. On the men's side, Germany's Thomas Freimuth won the event, just ahead of XC Ottawa's Karl Saidla, and Luc Theriault finished third. Devashish Paul's 2009 Gatineau Loppet Report #1- Jay Heins Saves My 20th! Sheila's 2009 Gatineau Loppet Report: Finally, a first! Steve Paradine's 2009 Gatineau Loppet Report #3: Lucky #4? Justin's 2009 Gatineau Loppet Reports: Welcome to the Main Event. 2008 was a BIG snow year for Ottawa, so the race course was in great shape. In this 30th edition, the Loppet adopted a new name. We're still trying to think of a nickname (Keskinada had Keski, Birkibeiner has Birkie, we have heard "Gloppet" but that won't do will it? The various events drew 2423 competitors, and for the most part the weather cooperated. Saturday's classic event began with some cold weather, but the sun was shining brightly and there was no wind. Sunday's skate race was another good weather day, with the temperature about minus 12 at the start, and warming up during the day. XC Ottawa team members competed in a variety of races and came home with a gold medal in the 29km Skate by Craig Storey, a bronze in the 29km classic courtesy of Justin Demers and Sheila and Megan making it into the money (top 5) for the 53km skate! Lofty goals of mere survival, by Alicia Berthiaume and Steve Bursey. The Triple Folly, by Parham Momtahan. 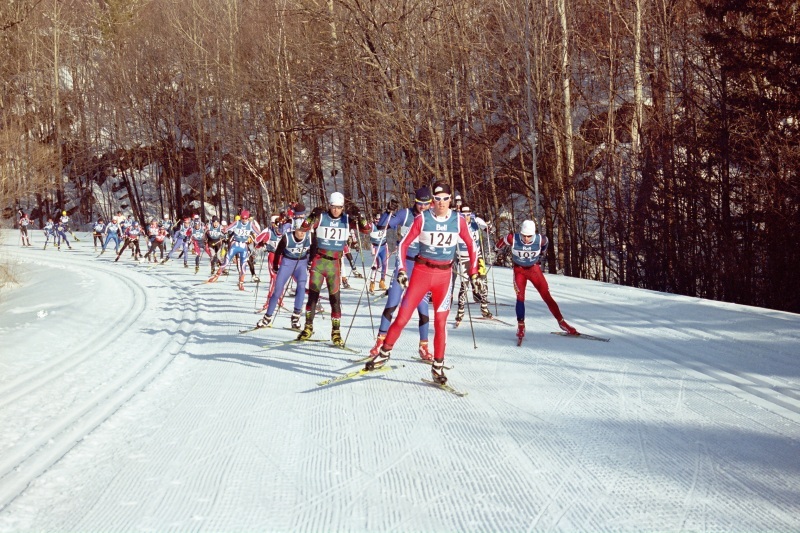 53-km Skate-ski Race, by Thomas Seniuk. 29km Classic, by Justin Demers. Racing the Gatineau Loppet (for the first time), by Lindsay Los. 2008 Gatineau Loppet Photos from MusicianOnSkis.ca, Jo-Ann Holden. 2008 Gatineau Loppet Reports - Downtown skier's review, by Steven Paradine. 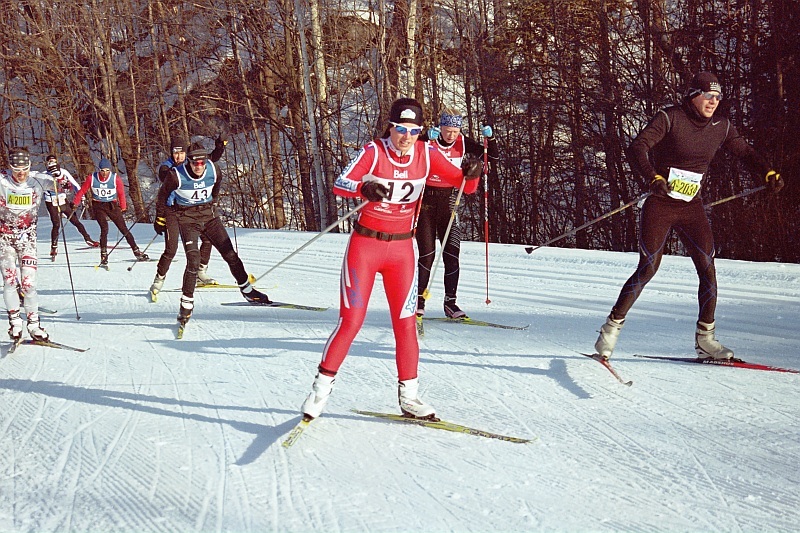 The 29th edition of the largest cross-country ski event in Canada took place February 15-18, 2007. Over the week-end, 2716 people participated in the various races. Unfortunately, due to the low snow winter the course were modified so that races were mainly held on the parkways with trails #1, #3 and #15 removed. Temperatures and the wind cooperated quite nicely to make it the warmest Keskinada in recent memory. Conditions were however a bit slow, and so were the times as many skiers spent much longer than expected on the course. More fun for all! Keskinada: 10 Tips for Fast Enjoyable Parkway Racing! Keskinada Course Update: No Ridge Road? The 28th annual Keskinada took place from the 17th to the 19th of February 2006. This year's edition featured a modified 2 loop classic course due to warm weather and heavy rain on the Tursday followed by a flash-freeze at Friday night at 6:00pm that saw the temperature drop 20?C in one hour. The course was a skating rink the night before the race. But Lafleur renovated and tilled the course repeatedly all night to break-up the ice and conditions were excellent Saturday morning. Klister was required, but with binder loosing your wax wasn't an issue. The new course was somewhat congested for B-F wave skiers and many poles were broken. As usual the classic race took place in <-20?C temperatures. The sprints were postponed to Saturday night due to the icy course and subsequently held in blistering cold conditions. See this 2006 Keski Sprint report article. The skating race took place in moderate -15?C temperatures on a very fast course, but somewhat abbrassive, course that was in excellent shape. Interview with Claude Laramee about the new course and why they made the changes. Our waxing Suggestions: Classic, Skating. Sponsor Sheila for the Keskinada and support the Bone Marrow Transplant Fund. How was your 2006 Keskinada? 2006 Keski Climb Rollerski Race..
XCOttawa Skiers win 2006 Keski Climb and Canadian Rollerski Championships! 2005 Keski Climb Rollerski Race.. Conditions: slow and sluggish with 10cm of new snow falling on race morning which remained ungroomed! Conditions: cold - old thawed/frozen snow, fast. Conditions: Ice storm year - race shortened to 42 km. Keskinada and Gatineau 55 pre-1997? Well, our memories don't stretch back that far, but we're sure some of your do! Anyone who can provide weather details, a race report or story, a press clipping or any information about any previous Keski or Gatineau 55 should sent it our way. We'd love to hear about it sucess or disaster. More Gatineau Loppet (Keskinada) Reading. . .
Gatineau Loppet: 2008 Gatineau Loppet Reports: Lofty goals of mere survival. Gatineau Loppet: 2008 Gatineau Loppet Reports - Downtown skier's review. Gatineau Loppet: 2008 Gatineau Loppet Reports: Is it more challenging to race both 29kms or one 53km? Gatineau Loppet: Keski Report #8 - There are a lot of hills in the Gats! Gatineau Loppet: 2012 Gatineau Loppet: 23 out of 23..A Bit Slower Though! Gatineau Loppet: Keski Report #6 - My Keski Hero! Gatineau Loppet: Your Keskinada Suggestions! Gatineau Loppet: 2009 Gatineau Loppet Report #3: Lucky #4? Gatineau Loppet: 2009 Gatineau Loppet Report #1- Jay Heins Saves My 20th! Gatineau Loppet: 2013 Gatineau Loppet Report #1 - From the other end of the spectrum. 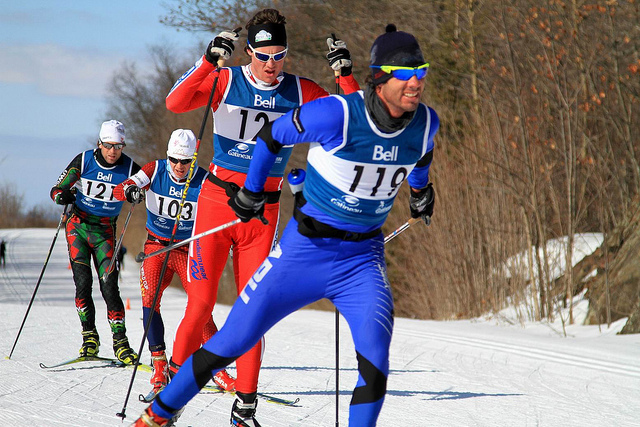 Gatineau Loppet: Just a few days left to save 25% on Gatineau Loppet 2012! Gatineau Loppet: 2007 Keskinada Course Update. No Ridge Road? Gatineau Loppet: More of the Same, ONLY BETTER for the 37th Edition of the Gatineau Loppet! Gatineau Loppet: 2008 Gatineau Loppet Reports - A Classic this Year My Best! Gatineau Loppet: More Than 600 Skiers Already Registered For Gatineau Loppet! Gatineau Loppet: Une 32e Gatineau Loppet au goût olympique!